This pickup is based on DeArmond Gold Foil pickup from -60's. Original style design. 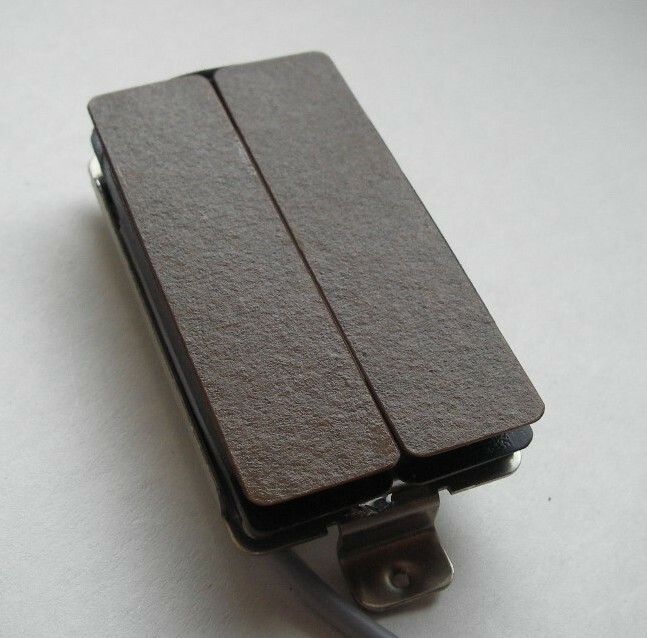 The pickup uses rubberized ceramic magnet, which has noticeably lower gaussing than Ceramic8. Base plate of the bobbin is made of mild steel, which is an important detail creating the true tone. Magnet wire thickness 0.05mm. The sound is quite Strat like but smoother. Very clear true single coil sound. Two non-magnetic stainless steel mounting screws includes. Two conductor shielded wire. Walnut, Zebrano, Masur Birch​​, Flame Maple, Purple Heart and Indian Rosewood*. Top-plate choices: Gold Foil, Mother of pearl, Abalon and Santos rosewood. ​The guitar is Les Paul Smartwood and the pickup is early Gold Foil Bucker prototype. The sound is quite strong if used the coils in series. Works even as a good rock pickup. In parallel the sound is bright and sweet. The coil split gives bright and clear single coil sound. Nickel-Silver cover and base plate.